Not super exciting yet, but a promising start. 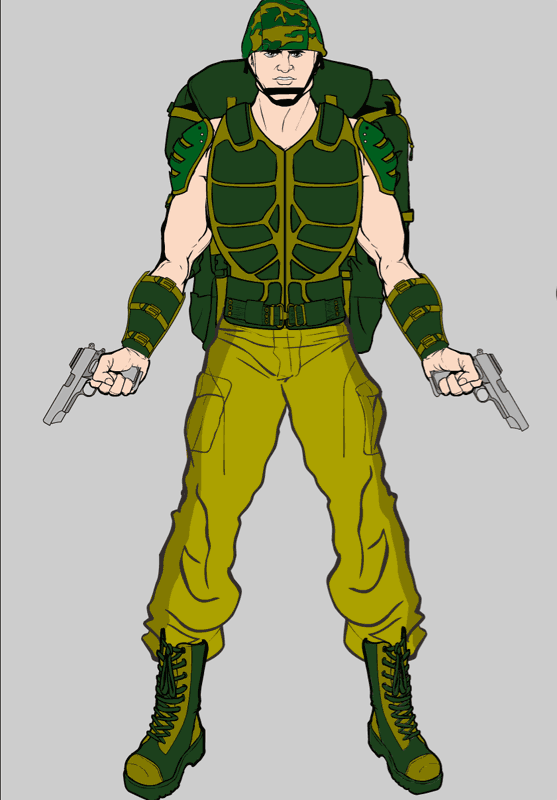 If you have any items you'd like to see included, now's the time -- guns, helmets, combat jackets, you name it. Post a link to an image in the comments and I'll go have a look. I have to say, at this stage of the FaceMaker development, the thing that most surprised me was what a big change the ability to change the line color. In the Warrior Mini, the biggest two surprises are how much being able to move and scale items is, along with the utility of masking. Pretty neat, I can't wait to get it to a usable point so you all can tinker with it. I’ll give it a shot. No pun intended. Also, his pants are weird. The shading lines are real light on them, particularly near the ankles, which makes them look more like something in the background in contrast to the sharp lines on everything else. They also don’t tuck into his boots very well, but I’ll let that one go. Hmm, maybe I’ll have to sculpt that breastplate a bit more then. We don’t want turtles running rampant through our military. Maybe tighten up the pants a bit too. The boots/pants are actully something I find slightly annoying about 2.5. I’ll find a great pair of boots/paints but when I put them on either the pants are stick out from behind the boot or the boot out from behind the pants and it looks blah. Maybe make more boots/pants that go together? Also, what about including some more uniform options either for this or HM3? It’d be cool to have a US Marine dress uniform, or a WW1 German spiky helmet, things like that. Hands are a separate item, so I’m definitely planning on having a palm-down version, along with fingers extended, relaxed, etc. All of them will have their own mask, so you can (if you choose) put items in there that mask themselves out appropriately. In other words, if you put a gun in the hand you can block out the parts of the gun that would be hidden behind the hand. Using HM for a lot of character imagineering, I find myself wanting more options for the energy/magic choices for the hands–they are cool, especially when playing around with transparancy–but for a fantasy vs sci fi look, it is pretty limited. I’d like to see more variety in this area. Thanks. Well, I love centaurs, so if you could put anything with em (i.e. isignia, legs, tattoo, etc.) I’d be much obliged!